5100-iSIC Typical Site - NexSens Technology Inc. The NexSens 5100-iSIC supports landline Ethernet communication between a remote monitoring site and a computer base station with an internet connection. 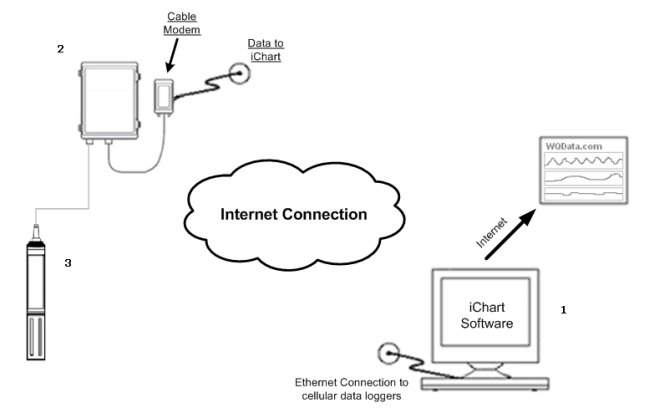 It is the most desirable system for a monitoring site where an Ethernet connection is available at the remote site. A computer running iChart software will have a configuration file, called an ICR on it. This file is created in iChart and holds information such as which data loggers are used, and which sensors are connected to that data logger. With this ICR file, data can be uploaded and processed from the data logger.